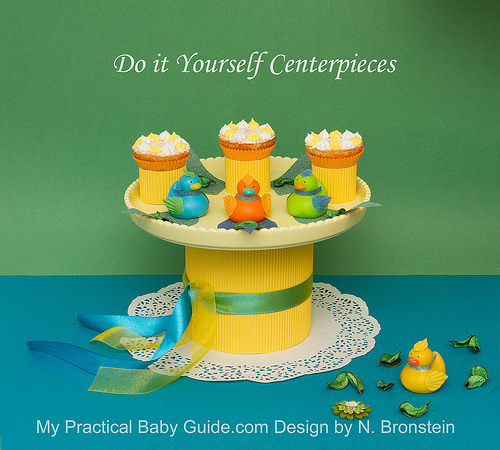 As many visitors have shown interest in our DIY centerpieces, we decided to expand our line and design themed baby shower objects which will include table centerpieces, table arrangements, cupcakes toppers, invitations, favors and bottle labels. 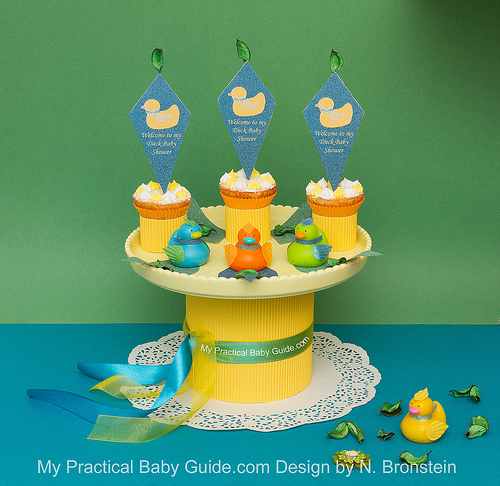 This is an impressive and easy to make centerpiece designed especially for a Duck Themed Baby Shower. The color scheme includes shades of blue, orange, yellow, green and white. We used a yellow footed plate and covered the foot with a canary yellow corrugated paper. We placed a sheer yellow ribbon over a dark turquoise one to get a greenish effect and tied them together around the foot, leaving the ends to fall freely as waves. The plate stands on a paper lace circle placed over turquoise ground. On the plate we placed three, hard plastic, quality colored ducks and decorated them with paper cuts made out of paper cupcake liners to simulate ducks wings. 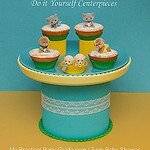 Behind, we placed three sponge cupcakes which we carefully baked and decorated with tiny meringue kisses and confectioners sugar. 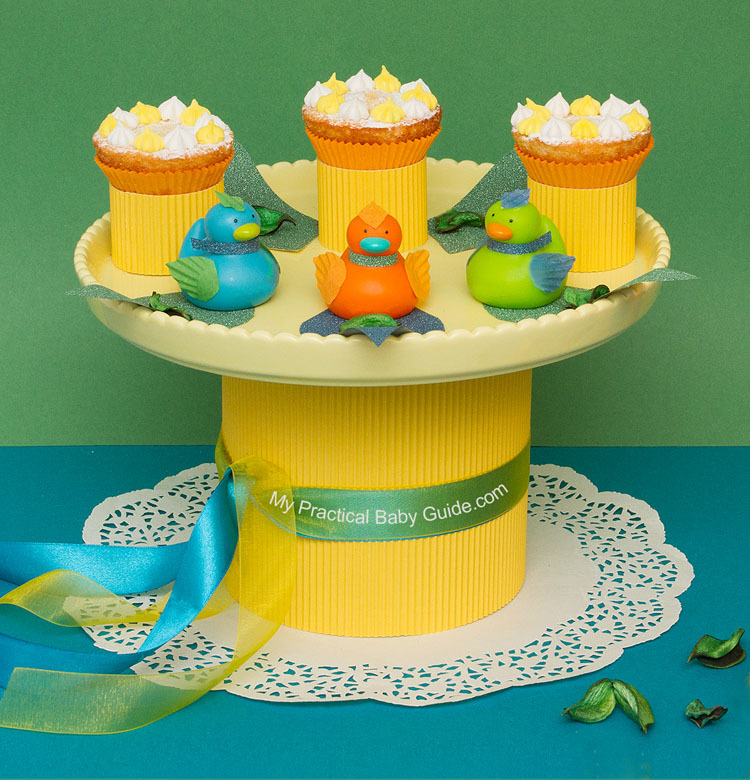 The cupcakes sit in light orange paper liners inserted in rings of canary yellow corrugated paper. 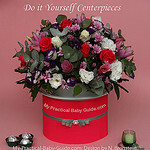 Five glitter leave shaped paper cuts add color and richness to the centerpiece. At the right bottom, a single duck is swimming around decorations of leaves and water flower. 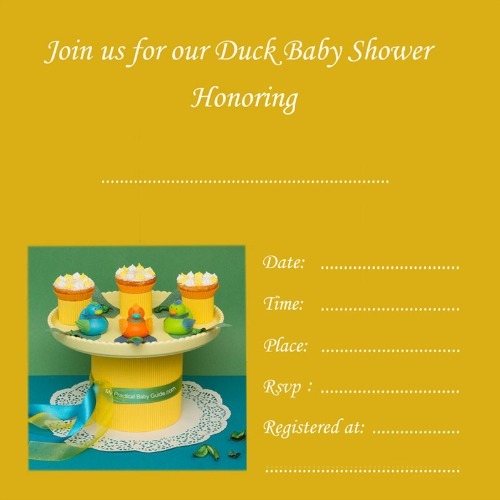 These duck baby shower ideas are the first in our new line so please visit us again, you may find just what you are looking for. 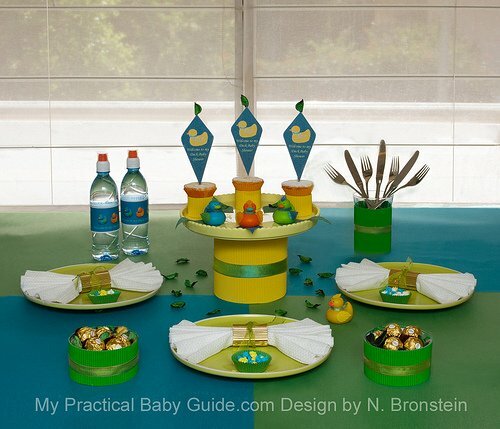 This is a suggestion for the duck baby shower table setting. We used the centerpiece (see detail above ) and placed it on green and blue sheets of thick Canson paper arranged in a checkerboard pattern. Large soft white napkins folded as fans to simulate wings were inserted into metallic gold corrugated rings tied with sheer green ribbon and placed over lime colored plates to compliment the background. 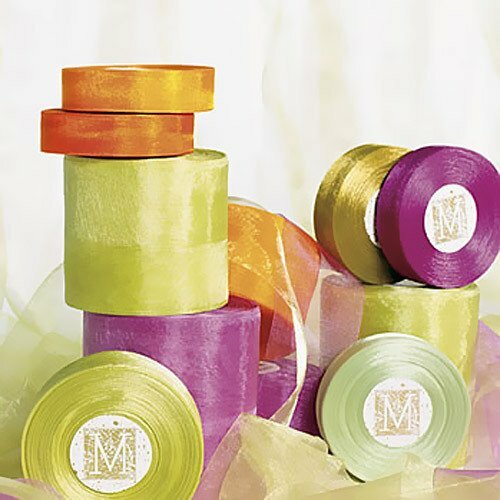 Two small bowls filled with candies and covered with green corrugated paper, and a matching paper covered glass which holds the cutlery, were tied with a sheer golden ribbon for a luxurious look. 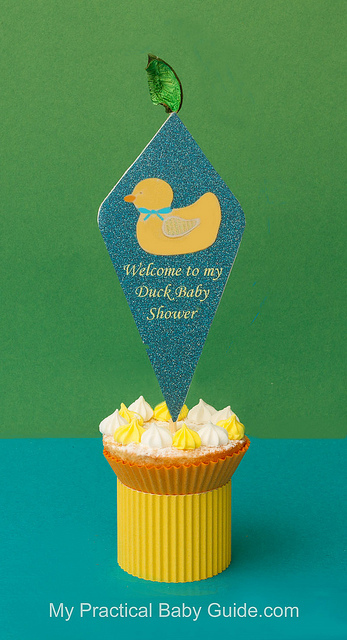 The water bottles, covered with our free printable duck labels, add interest to their look. Dress up water bottles with labels to match your party. This adds just a little bit of fun to boring water bottles and helps to tie the entire theme together. 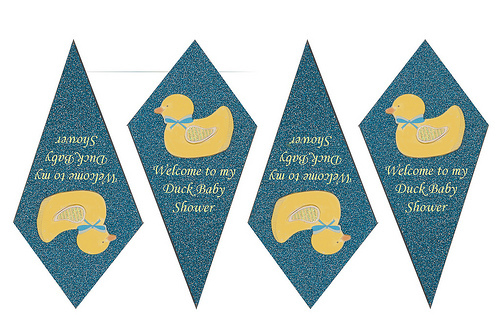 Below is a free duck baby shower label to decorate your bottles. 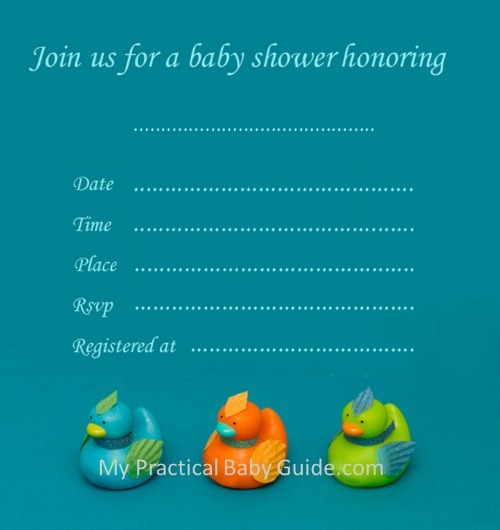 These invitations designed by us can be used freely. To get a lovely effect, use a silver, metallic ink pen to write the text on this blue background invitation. Metallic pens can be found at www.CreateForLess.com. Tip Type Metallic Pens in the search box and you will find a large selections of these supplies. To get a lovely effect, use a copper, metallic ink pen to write the text on this mustard color background.